Calls for revenge and glowing eulogies for Sheikh Omar Abdel Rahman by the Muslim Brotherhood and its followers dealt a blow to efforts to paint it as a moderate group. 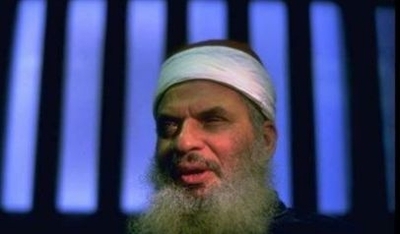 Abdel Rahman, known as the "Blind Sheikh," died Saturday in a U.S. prison where he was serving a life sentence for a seditious conspiracy to launch what prosecutors called a "war of urban terrorism" against targets around New York City. He also helped plot the first World Trade Center bombing in 1993 that killed six people and injured 1,042. "May Allah's blessings be upon him, the deceased of the Islamic call, who was imprisoned by different repressive regimes, who was falsely and unfairly accused of terrorism by the Unites States of America, while being old and blind Sheikh, it also prevented him from receiving medical care until he met his Lord, Oh Allah please accept him and have mercy upon him," the Muslim Brotherhood General Office said. Andrew McCarthy, who prosecuted Abdel Rahman, noted in a National Review Online column that the "Blind Sheikh" was proud of being a terrorist. This fact ought to raise red flags about the character of the Muslim Brotherhood. McCarthy cited this Abdel Rahman statement as an example: "Why do we fear the word terrorist? If the terrorist is the person who defends his right, so we are terrorists. And if the terrorist is the one who struggles for the sake of God, then we are terrorists. We . . . have been ordered with terrorism because we must prepare what power we can to terrorize the enemy of Allah and your enemy. The Koran says 'to strike terror.' Therefore, we don't fear to be described with 'terrorism.' . . . They may say, 'He is a terrorist, he uses violence, he uses force.' Let them say that. We are ordered to prepare whatever we can of power to terrorize the enemies of Islam." 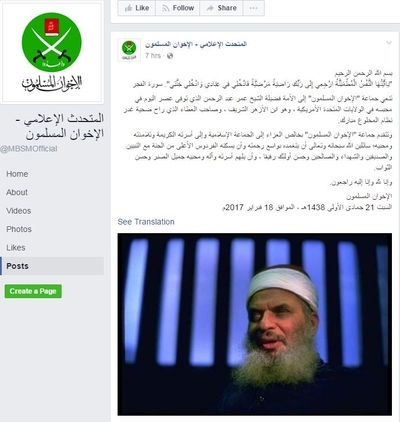 The Muslim Brotherhood's official Facebook page posted another statement Saturday that was quickly taken down. The message, asking "God Almighty to bestow His Mercy, and ensconce him in the highest paradise of Heaven with the prophets, the saints, the martyrs, the righteous and the best of them as companions" was cross-posted on Ikhwanonline, the Brotherhood's Arabic website. Although Abdel Rahman left the Muslim Brotherhood to form the radical jihadist group Gamaa Islamiya in 1970 after the Brotherhood's leadership renounced violence against the Egyptian government, Brotherhood leaders still mourned him in terms echoed by ISIS and al-Qaida. Mohamed Al-Sagheer, a former deputy minister of endowment in Egypt during the Muslim Brotherhood rule, called Abdel Rahman a "Mujahid" or holy warrior, in a video posted on Facebook. Muslims, he said, lost one of their most prominent scholars. "May Allah avenge from those who did him (the sheikh) injustice, the Arab despots, and the crusaders, who loath and hate the faith and its followers," Al-Sagheer said. Al-Sagheer has ties to violent elements of the Muslim Brotherhood that have worked against the Egyptian government since the military forced the Brotherhood out of power in 2013, the Middle East Media Research Institute (MEMRI) reports. Mohamed el-Feky, chairman of the economic committee of Morsi-era Egyptian parliament who now resides in Istanbul, similarly lamented Abdel Rahman's death. "May God have mercy on Sheikh Omar Abdel Rahman and gather him into the troop of prophets, friends (of God) martyrs and the righteous, with the best of them as companions. Oh, God, compensate him for his imprisonment, and the wrong done him, and bless him with good and increase. Oh God, curse those who wronged him, Oh Lord of the worlds," el-Feky wrote on Facebook. Ordinary Muslim Brotherhood supporters like Abdel Rahman Muhammad Lotfy Abdel Rahman called for American blood. "If they killed you O Omar, Allah has chosen you among the martyrs! Allah will fight you O America ... Today, America has killed one of the Muslim scholars after unjustly detaining him for close to a quarter of a century, that is Dr. Omar Adel Rahman, the pious scholar, who always uttered the word of truth, which resonated out of his mouth, he did not fear anyone but Allah, and we present him to Allah. We ask Allah to accept him as a martyr, they killed him for America and its allies, who participated in killing him," Rahman wrote. Abdel Rahman's ideas inspired Osama Bin Laden, al-Qaida and ISIS. He acted as al-Qaida chief Ayman al-Zawahiri's "mentor." Al-Zawahiri frequently attended Abdel Rahman's lectures as a young man in Egypt. Al-Zawahiri and Osama bin Laden handed out copies of Abdel Rahman's will at a 1998 press conference. The will demands vengeance after his death. "But, take revenge for me against them with the most extreme and violent revenge." Bin Laden and al-Zawahiri also passed out a fatwa from Abdel Rahman smuggled from prison authorizing attacks against the U.S. at the 1998 press conference. "Cut all relations with [the Americans, Christians, and Jews], tear them to pieces, destroy their economies, burn their corporations, destroy their peace, sink their ships, shoot down their planes and kill them on air, sea, and land. And kill them wherever you may find them, ambush them, take them hostage, and destroy their observatories. Kill these infidels," the fatwa said. Al-Qaida responded to Abdel Rahman's death by including the incendiary will in its latest newsletter Al-Nafir. Numerous jihadi social media sites followed suit, and the will accompanied a joint statement by al-Qaida in the Arabian Peninsula (AQAP) and al-Qaida in the Islamic Maghreb (AQIM), both of which are openly loyal to al-Zawahiri. The joint AQAP/AQIM statement calls on their followers to "viciously avenge the sheikh against his oppressors and wardens." 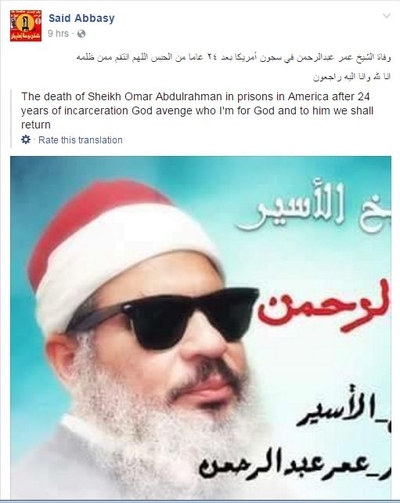 Said Abbasy, a Muslim Brotherhood supporter living in New York, wrote on Facebook, "The passing of Sheikh Omar Abdel Rahman in the prisons of America after 24 years of incarceration. Oh God take vengeance on those who wronged him." 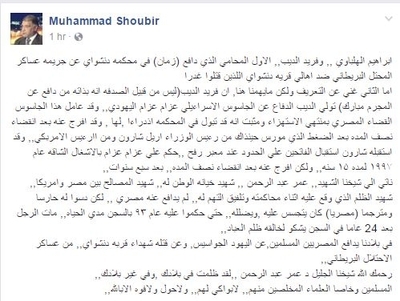 Muhammad Shoubir, a self-described Muslim Brotherhood supporter who lives in New York, called Abdel Rahman "our martyr sheikh" in a since deleted Facebook post. "A martyr to the interests between Egypt and America,, (sic) A martyr to the injustice done to him during his trial and the concocting of an accusation against him,, No Egyptian defended him,, but they thrust upon him a guard and a translators (Egyptian) who spied on him, and misled him,, so that he was sentenced in 93 to imprisonment for life,, the man died after 24 years in prison ... May God have mercy on our noble Sheikh Omar Abdel Rahman,, He was wronged in your country, and elsewhere,," Shoubir wrote. Jihadis aligned with various undefined factions used similar rhetoric in their social media eulogies. "Not with tears but with red blood. We will lament Imam Omar Abdel Rahman," said handle @ Yubayatajrasi09, who lives in the Tampa area. In an inflammatory Twitter post on Saturday, an individual identifying himself as Obamajahid pushed a baseless conspiracy theory to blame the Trump administration for Abdel Rahman's death. "Sheikh Omar Abdel Rahman is among the first victims of the rule of the tyrant Trump where pressure was exerted upon him in his prison, and he was deprived of his medicine and his radio as was mentioned someone who contacted them last week," Obamajahid wrote. Another follower of Abdel Rahman's, Yubayatajastri09, called for vengeance. "Oh God, forgive us for our shortcomings with regard to him. And raise his degree and accept him among the number of martyrs. And take vengeance on the head of the viper America," he wrote. It's hard to claim the Muslim Brotherhood opposes terrorism when it laments the death of the man who inspired an attack on New York City, plotted even greater bloodshed and inspired bin Laden and al-Zawahiri.